President Trump told North Korea to "not underestimate us," in a speech before the South Korea's National Assembly Wednesday morning local time. "Do not underestimate us. Do not try us. We will defend our common security, our shared prosperity, and our sacred liberty," Mr. Trump said. The president, who has softened his rhetoric on North Korea in recent days, urged other nations including Russia and China to sever economic ties with the rogue state. Mr. Trump, in the middle of his nearly two-week Asia trip, heads to Beijing next. "The time for excuses is over," Mr. Trump said. "Now is the time for strength." The president spent much of his speech contrasting the success of South Korea with its neighbor to the north, saying South Korea's success threatens North Korean leader Kim Jong-un's "dark fantasy." Mr. Trump said North Korea looks to cause trouble abroad to avoid the reality of failure at home. "This reality, this wonderful place, your success, is the greatest cause of anxiety, alarm and even panic to the North Korean regime," the president said. Mr. Trump called North Korea, "a country ruled as a cult" by Kim and his regime. Shortly before the speech, Mr. Trump scrapped a last-minute attempt to visit the demilitarized zone between North and South Korea because of poor weather. The president's team flew and nearly reached the DMZ, but had to return to Seoul because of fog. Mr. Trump said the world cannot tolerate a rogue regime like North Korea, calling on all nations including China and Russia to sever all ties with North Korea. The more time passes, the fewer options there are to deal with North Korea, he said. "America does not seek conflict or confrontation but we will never run from it," the president said. 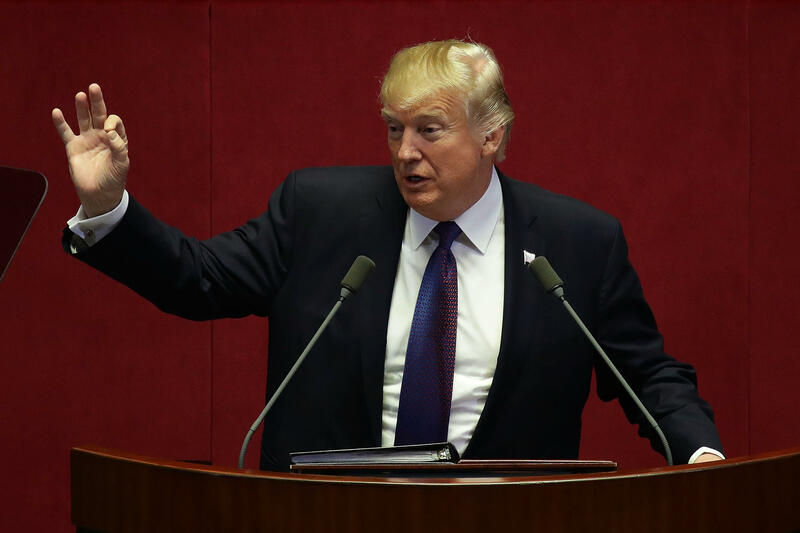 Mr. Trump said South Korea's success threatens the "dark fantasy" of Kim to the north. Mr. Trump said North Korea looks to disruption abroad to avoid the reality of failure at home. Trump: "North Korea is a country ruled as a cult"
Mr. Trump said North Korea is a "country ruled as a cult" by Kim. Mr. Trump described the dismal conditions in North Korea, where starvation is rampant. The president called the conditions in North Korea "twisted," without yet mentioning leader Kim Jong-un by name. The president mentioned how the U.S. Women's Open Championship was held at one of his properties in Bedminster, New Jersey. He touted how Korean golfers performed among the best. "The United States under my administration is completely rebuilding its military," he said. The president said the U.S. will work with Korea better than any other nation ever has. He said he knows Korea will be a "faithful ally" of the United States, "very long" into the future. The United States is going through a "miracle"
Mr. Trump said the U.S. is going through a "miracle" of sorts itself, with the stock market booming, and ISIS being defeated. President Trump gave a rundown of the South Korean economy, saying that in one generation, life expectancy, and the economy have soared. Trump says it is an "honor" to build the relationship between the U.S. and Korea. That relationship was forged in war, and strengthened through the alliance of history, he said. Mr. Trump said U.S. and Korean soldiers have fought, sacrificed and triumphed together. President Trump, accompanied by first lady Melania Trump, enters the chamber. According to a translator, the reason the president was delayed is that he was working on the text of the speech. "The alliance between our nations was forged in the crucible of war and strengthened by the trials of history," Mr. Trump is expected to say. "Today, I hope I speak not only for our countries, but for ALL civilized nations, when I say to the North: Do not underestimate us. AND DO NOT TRY US," the president is expected to say. "We will defend our common security, our shared prosperity, and our sacred liberty." "The world cannot tolerate the menace of a rogue regime that threatens it with nuclear devastation," the president is also expected to say. "All responsible nations must join forces to isolate the brutal regime of North Korea-to deny it any form of support, supply, or acceptance."